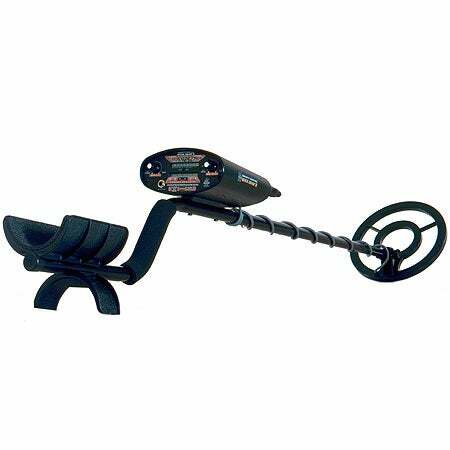 The Bounty Hunter Quick Draw II Metal Detector is equipped with a powerful micro-chip computer circuit and patented Bounty Hunter technology to detect more specific targets and depths with tremendous accuracy. The entire line of Bounty Hunter metal detectors operate on two 9-Volt batteries and are designed to be lightweight and ergonomic for easy handling and comfortable use. Their standard motion all-metal mode detects all types of metal, while the progressive discrimination control eliminates iron and other unwanted items. As the metal detecting coil nears a target, the Quick Draw II three-tone audio feedback aids in distinguishing between valuables and undesirable metals. This model also comes equipped with a 1/4" headphone jack compatible with most headphones for privacy while treasure hunting. In addition, Bounty Hunter equips all their metal detectors with a preset ground balance that neutralizes the response to mineral content in the ground.